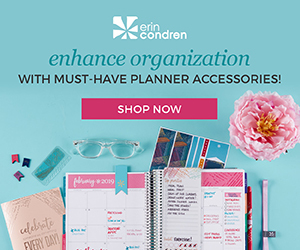 There are a lot of things I love about the holidays – baking sugar cookies, seeing Christmas lights, shopping ridiculous online sales (but really though…my poor wallet). In all seriousness, there’s something inherently magical about the month of December. Even though we’re all grumpy about the cold and dealing with crazy traffic and lines at stores, there’s still an excitement in the air that makes everyone seem at least a little bit festive. 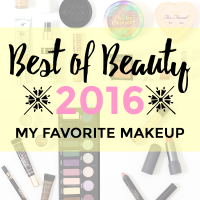 In true beauty blogger fashion, I channel a good chunk of my holiday spirit into my makeup game. It’s not that I won’t occasionally rock a glam look year round, it just that as soon as the Christmas decor is up I find myself busting out the glitter and lashes pretty much every weekend. 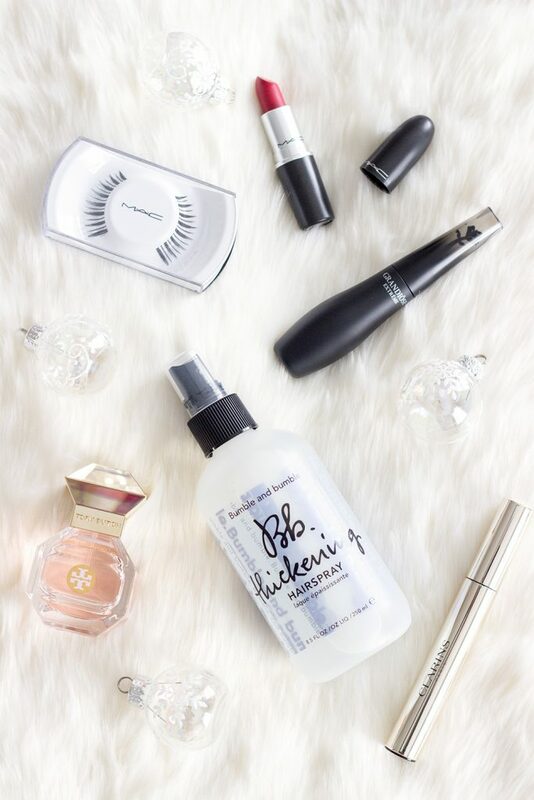 Recently I received this beautiful PR package from Bloomingdale’s with a selection of products that are perfect for creating a classic glam holiday look. 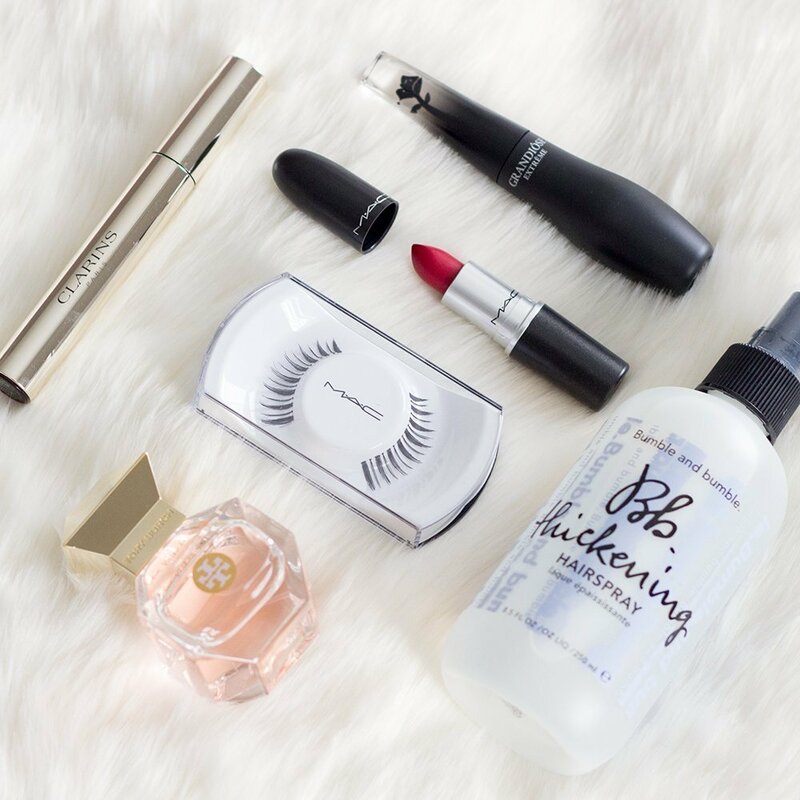 From a bold red lip, to fluttery lashes, to a signature scent, and a killer ‘do, you’ve got everything you need to channel your inner old Hollywood starlet. Even us lazy girls like to make sure our hair looks on point during holiday celebrations. Aside from the fact that waiting for it to air dry in the freezing cold is not exactly pleasant, it feels good to sometimes put forth a little extra effort and style my hair with hot tools. 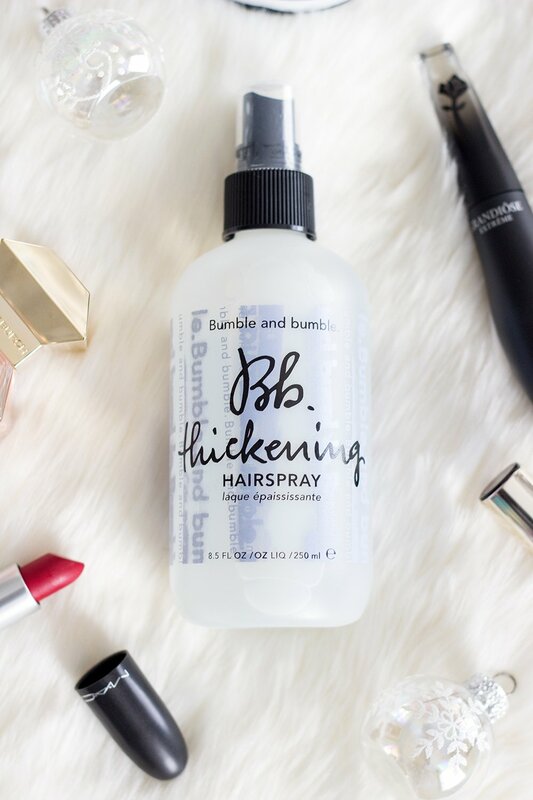 I’ve been using the Bumble and Bumble Thickening Hairspray ($29) for years, so I totally welcomed a backup bottle to keep on hand. 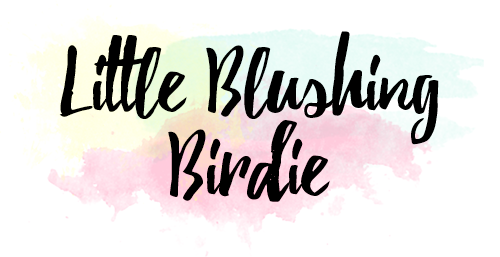 If you’ve been following my blog or YouTube channel for any length of time, you’ve probably heard me gripe more than once about my flat hair struggles. This non-aerosol hairspray has been a total game changer for me. I actually like to spray it into my towel-dried hair right before I blow dry it to create extra lift and volume at the roots. It doesn’t leave my hair feeling sticky or crunchy at all and has just the right amount of hold. On the downside it does smell kind of strongly of alcohol, but the scent doesn’t linger for very long. 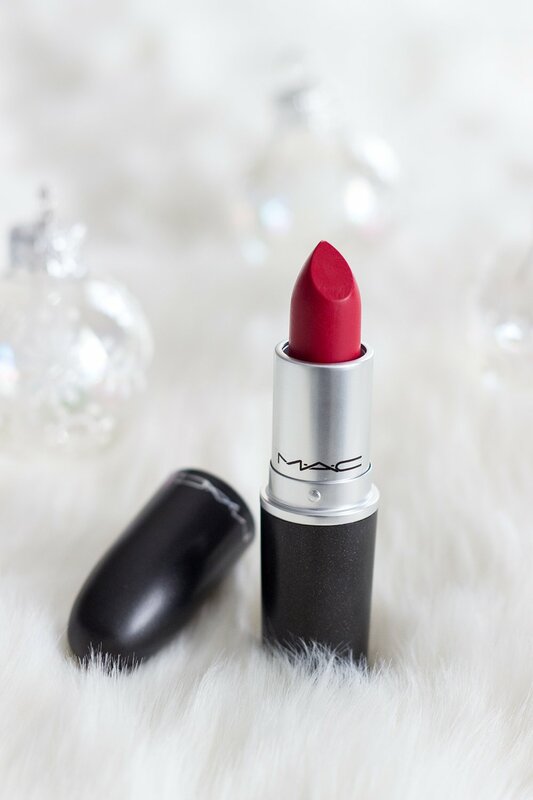 If you want to talk about a classic red lipstick, what is more iconic than MAC Ruby Woo ($17)? 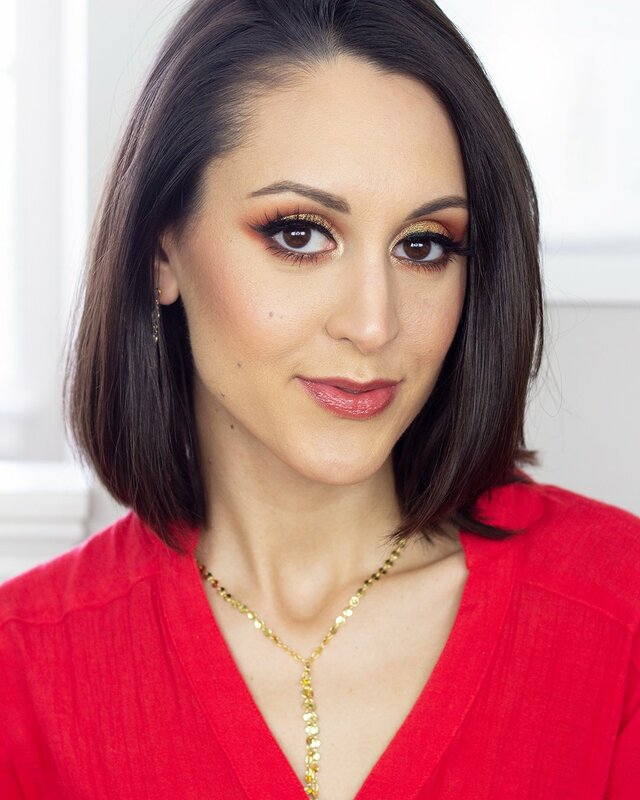 This matte red shade has a serious cult following in the beauty community, and now I finally understand why. The texture of this lipstick is a bit on the dry side, but it packs tons of pigmentation and is ridiculously long wearing on the lips. Ruby Woo is an absolutely stunning true red that I think would be flattering on just about anyone. 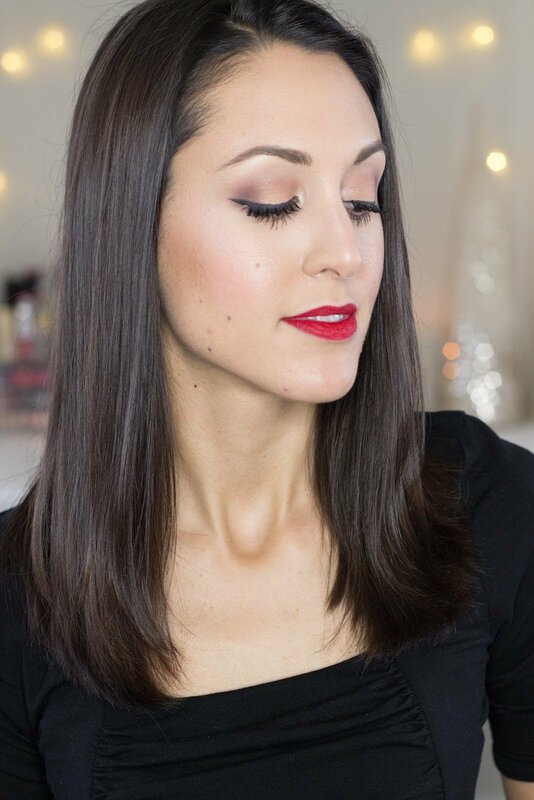 While I think red lips are especially festive at the holidays, I think they’re also classic enough to be worn all year round. This is one of those products I think I’ll be reaching for on days requiring a little extra fierceness. 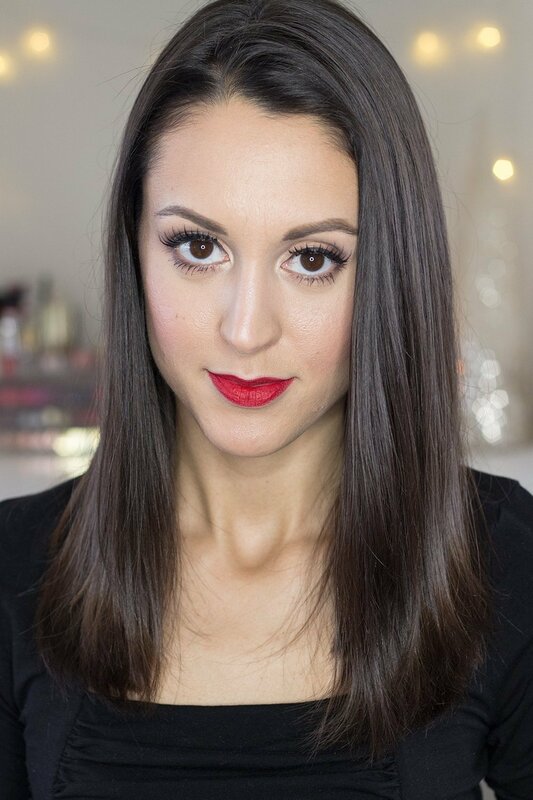 I love balancing a bold, red lip with a neutral eye. You know, channel those Marilyn Monroe vibes. 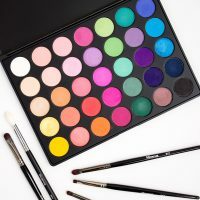 I’ll keep the eyeshadow to a minimum, maybe create a fierce wing, and load on the mascara. If you’re a fan of traditional bristle brush wands, the Clarins Supra Volume Mascara ($27) will certainly speak to you. The sleek mirrored packaging screams classic luxury and that’s exactly what you’ll find with this formula. It’ll give your lashes quite a bit of length and volume while still maintaining a fluttery, natural appearance. On the other hand, if all you want is to bring on the drama, the Lancôme Grandiôse Extreme Mascara ($32) might be more your speed. First, can we PLEASE talk about the packaging of this product? From the curvy bottle, to the ombre handle, to the rose accent, it really is a thing of beauty. This is one of those products that sits on your vanity and says, “Go ahead and stare. I know I’m special.” Even the wand design is unique. Rather than being straight like a traditional mascara, it’s got a swan neck shape that makes it easy for you to access every last lash without worrying that you’re going to end up with rogue mascara on your nose or eyelid (…the struggle is real). 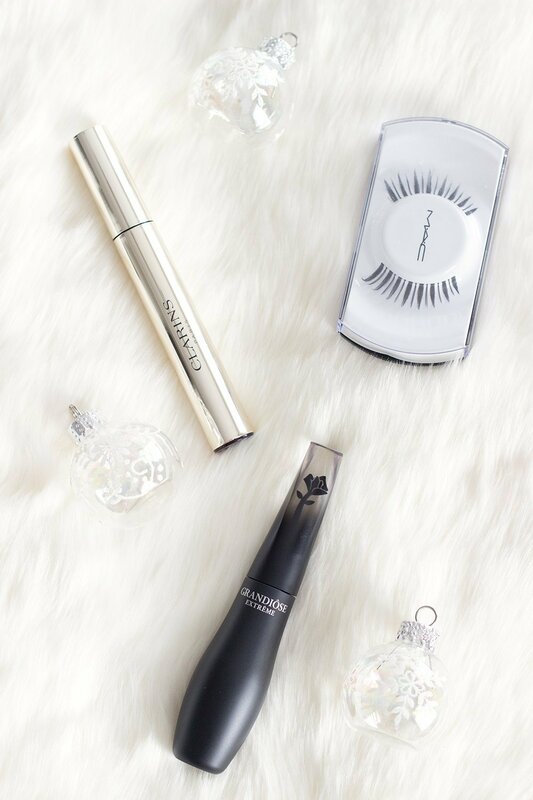 The formula of this mascara is incredibly think and easily clumps, so it does take a little extra effort and patience to build it through your lashes and keep them from looking overly spidery. But if you’re willing to take the time to apply it properly, it really is a beautiful mascara that keeps your lashes looking voluminous all day long. Now, if you really want to take your holiday look up another notch, try throwing on a pair of false lashes. This MAC 7 Lash ($17) pair has a really lovely wispy design that lets your natural lashes shine through. The tapered shape of the 7s is perfect for giving you that cat eye effect, which can be really flattering on round eyes like mine. I honestly would have never though to purchase lashes like these ones on my own, but I absolutely love the way that they look on my eyes! And of course, if you’re going to look like a bombshell, why not smell like one too? I’d never tried a Tory Burch fragrance before, so I was really excited to give this one a go. Tory Burch Love Relentlessly ($86, 1.7 oz) is described as bold and romantic, with top notes of pink pepper and grapefruit, middle notes of rose and orris, and bottom notes of ambertonic and patchouli. The end result is something incredibly soft and feminine, lightly floral but also fresh. I think if you enjoy scents like Chloé and Elizabeth and James Nirvana White you’ll find Love Relentlessly quite addictive. Also, the bottle design is beautiful. 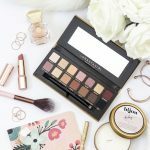 As a true girly girl at heart the combination of blush pink and gold totally has my heart. I feel so thankful to have had the opportunity to try all of these products out and am totally loving the look they helped me put together! Yes, these are all luxury splurges, but the quality of everything really was incredible. In the end I’ve always been a believer in balance when it comes to beauty. 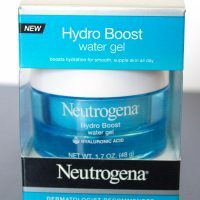 Of course there are some rockstar products at the drugstore, but sometimes its worth investing a little extra in something that really feels special. Beauty isn’t just about appearance, it’s about experience – the whole process of sitting down in front of your mirror and taking a few minutes (be it 5 or 35) to do something that makes you feel beautiful. 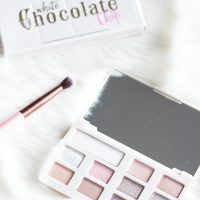 So maybe it’s not practical to have a vanity filled with high-end makeup, but I have to admit there’s something wonderful about having one or two luxury products that give you that “ahh” moment every time you put them on. 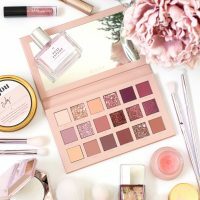 So whether you’re looking for a perfect luxury beauty gift for a lucky lady in your life, or you want to #treatyoself, this selection from Bloomingdale’s is the perfect place to start! 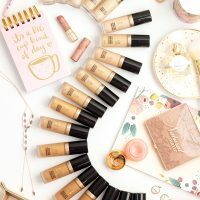 If you have that one special product on your vanity, I’d love to hear what it is! Tell me all about it in the comments down below.